The IKCO Samand is an Iranian-made car and titled first "national car" of Iran. Iran’s automotive industry is the second most active industry of the country, after its oil and gas industry, accounting for 10% of Iran's GDP and 4% of the workforce (700,000 persons). Iran developed a significant automotive industry with annual production of up to 200 thousand units under the Shah's regime. But after the Islamic revolution of 1979 production drastically decreased. Since the early 2000s, automobile production in Iran has grown exponentially. Iran's automobile production crossed the 1 million mark in 2007/2008. Today, Iran is the 18th largest automaker in the world and one of the largest in Asia, with annual production of more than 1.6 million. In 2009 Iran ranked fifth in car production growth standing next to China, Taiwan, Romania and India. According to OICA statistics, production dropped dramatically to under 750,000 automobiles and commercial vehicles in 2013. As of 2001, there were 13 public and privately owned automakers in Iran, of which two—Iran Khodro and Saipa—accounted for 94% of the total domestic production. Iran Khodro, which produced the most prevalent car brand in the country—the Peykan, which has been replaced in 2005 by the Samand—, was still the larger with 61% of the market in 2001, while Saipa contributed 33% of Iran’s total production in the same year. Iran Khodro is one of the largest car manufacturers in Asia. It has established joint-ventures with foreign partners on 4 continents. The Iranian manufacturers currently produce six different types of vehicle, including passenger cars, 4WD, trucks, buses, minibuses, and pickup trucks. The sector directly employs about 500,000 people (roughly 2.3% of the workforce), and many more in related industries. About 75% of local output is passenger cars, with pick-ups the next largest category, accounting for around 15%. Saipa Miniator/Tiba is the second national car of Iran. Iran Khodro is the largest car manufacturer in the Middle-East. It has established joint-ventures with foreign partners on 4 continents. 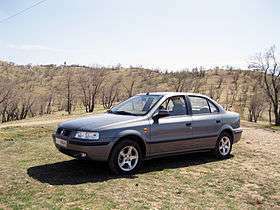 In 2008, IDRO reported that SAIPA accounts for 54 percent and Iran Khodro for 46 percent of the output. Although carmakers are listed on the stock exchange, the government still owns about 40 percent of both companies. In July 2010, the government sold a further 18% stake in both Iran Khodro and Saipa for about $2 billion in total, bringing down its participation in both companies to about 20%. In August, both deals were cancelled by the Iranian Privatization Organization. No clear reason was given for the cancellation of the deals, but analysts believe that discontent over the prices at which the blocks were traded is the most likely reason. Unofficial estimates put the sector’s debt to Iranian banks as high as 100 trillion rials ($4 billion). The other car manufacturers, such as Azhitechs, Bahman Group, Rakhsh Khodro, Kerman Motors, Kish Khodro, Raniran, Traktorsazi, Shahab Khodro, and others together produced only 6%. These automakers produce a wide range of automobiles including motorbikes, passenger cars, vans, mini trucks, medium-sized trucks, heavy duty trucks, minibuses, large size buses and other heavy automobiles used in commercial and private activities in the country. Iran Khodro Diesel has a dominant market share (+70%) in bus, truck and van production. Iran with having a fleet of 7 million passenger cars, buses and trucks ranked the world’s 16th biggest automaker and one of the largest in Asia in 2006 with annual production above 1 million units and 1.3 million in 2009, resulting in almost 1.5 percent of total world production of vehicles and 1 car per 10 person. By 2010 Iran's fleet reached 11.5 million cars and 14 million by 2014 (half of which are dilapidated). Sixty percent of passenger cars produced in 2008 will use natural gas as fuel or will be dual-fuel, and the remaining 40 percent will run on regular gasoline (2008). Some problems faced by the industry are slow deliveries of cars, lack of after sales services and low quality in the production of some cars. Car production in Iran has increased 445% between 1998 and 2008. Because of sanctions on spare parts by France's Peugeot and Renault, car production in Iran dropped by as much as 40% in 2012 before recovering somewhat in 2014 following the Geneva interim agreement. In 2014, Iranian car companies produced 1,090,846 cars and commercial vehicles, of which 925,975 were cars and 164,871 were other vehicles. More than half of the vehicles in Iran are over 25 years old (2007). The government has sought to upgrade the local fleet and the authorities aim to pull some 200,000 outmoded vehicles off the road each year, underpinning demand. According to estimates the demand stood at 1.5 million vehicles in 2007, which could not be met by the local producers. Auto manufacturing industry's share in gross national product is two percent and Iran's auto production rate in the global markets is 1.7 percent (2008). Previously buyers had been purchasing vehicles outright in cash, but now over half of all new car sales are through finance companies or on lease purchase schemes. There were more than 8 million motorcycles in Iran by 2010 and 1,500 motorcycles receive registration number plates each day. Motorcycles account for 30% of air pollution in Tehran. Domestically manufactured motorcycles conform to Euro 2 standard and they don't even use catalyst transducers while the world has now considered Euro 5 standard for motorcycles. In 2007 Irans car exports stood at around $500 million. Iran car exports reached $1 billion by March 2009. Overall production is expected to rise to 1.13 million units by 2012 ($200 million in exports expected by 2010) and 60,000 units exported by 2013. 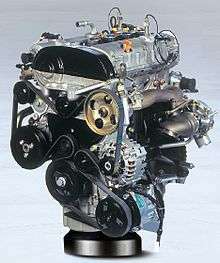 IKCO EF Engines are four-cylinder engines. The EF7 series are designed jointly by Iran Khodro Powertrain Company (IPCO) and F.E.V GmbH of Germany. Sapco and Sazeh Gostar are the respective purchasing arms of Iran Khodro and Saipa (the two largest Iranian auto manufacturers). The Iranian automotive parts industry consists of approximately 1200 companies (15,000 factories), which include those affiliated to vehicle manufacturers as well as independent firms. The industry consists of two primary sectors: Original Equipment Manufacturing (OEM) suppliers, which produce parts for auto makers, and After-Market Parts Manufacturers (AMPM), which produce replacement parts for vehicles. Over 39 countries purchase Iranian auto parts (2008). As of 2014, 10 tire manufacturing units are operating across the country with a production capacity of 240,000 tons per annum. They meet 70 percent of the domestic tire demand (11 million tires per year). As of 2015, 60% of auto spare parts in the Iranian market are imported from foreign countries. Most cars are produced in Iran under licence from foreign manufacturers and it depends on them for critical imports, ranging from airbags to computer chips (incl. engine control units and sensors). There are different ongoing R&D projects both at the governmental and private sectors. These projects research are mostly aimed at local market of Iran and its particular problems. New lines of locally designed and manufactured diesel, gasoline and dedicated CNG engines are being developed. There are also some research being done on hybrid and electric vehicles for the future Iranian market. In addition to this nanotechnology is being researched for introduction into production lines in order to improve the quality standards and customer satisfaction by offering anti-bacterial seats, anti-scratch paint, hydrophobic glass panes, maintenance-free air filters, anti-stain dashboards, nano-catalytic converters and nano-diamond containing lubricating oils. As of 2016, Iran had no known R&D project in the field of autonomous cars. Nissan Junior 3rd generation built by Zamyad Co. There are over 25 automakers in Iran, actively producing both light and heavy vehicles. These automakers are in joint venture with several popular international automakers such as Peugeot, Citroen (France), Volkswagen (Germany), Nissan (Japan), Toyota (Japan), Kia Motors (South Korea), Proton (Malaysia), Chery (China) and many other established producers of light and heavy vehicles such as Renault (France), BMW, Mercedes Benz (Germany), Daewoo and Hyundai (South Korea) have emerged since 1991. Italian carmaker Fiat has also announced of plans to begin production of its Siena sedan in Iran in 2008. Chery Automobile (China) in August 2007 entered into a US$370m joint venture with Iran Khodro, Iran to produce cars for West and South Asian markets. Chery Automobile is to hold 30% of the venture, and Khodro will hold 49%. Solitac, a Canadian front company, is to hold the remaining 21% of the venture. The factory will be in the Iranian city of Babol. Anhui Ankai Automobile (also of China) signed a deal in January 2008 with ARG-Diesel Iran to supply it with 600 buses, valued at €51.35m. The deal is to be complete by October 2008. Iran annually needs some 4,000 buses for its domestic transportation. Since the 1970s, Iran has been producing a number of different buses, such as German Mercedes and MAN as well as Swedish Scania and Volvo that it has exported throughout Asia. Daewoo Bus Corp. and an Iranian automaker Ardebil Sabalan Khodrow-Maywan have teamed up to build buses in Iran. The plant, which is slated to be completed by March 2010, would have a production capacity of 2,000 buses per year and would produce some 800 city and intercity buses in the 18 months after its inauguration. Based on the agreement, the engines and gearboxes would be manufactured in South Korea. But production would increasingly shift to Iran, where about 60 percent of the parts would be made. Since 2016 and the lifting of the international sanctions, nearly 40 foreign automakers, including Peugeot, Mercedes, and Toyota, are considering using Iran as a hub for their ME and regional exports. Car imports have risen, from $184 million in 2002 to $1.5 billion in 2007. In 2006, the government lowered the automotive import tariff levels to 90 percent for light weight vehicles and since then a huge influx of imported vehicles has been witnessed in the country. The tariff level for import of heavy vehicles is even lower at 20 percent, due to low levels of local production and high demand. As a result, a variety of automotive brands are being presently imported into Iran including Toyota, BMW, Mercedes Benz (these three being the expensive and/or luxury brands), Rover, Ssangyong, Audi, Subaru, Volkswagen, Renault, SEAT Leon and variety of heavy vehicles, construction and mining equipment from leading manufacturers such as Mercedes Benz, Renault, Iveco, Mann, Kamaz, Caterpillar. As of 2015, Iran has 3,200 gas stations for 15 million automobiles. Demand is supported by the fixing of fuel prices well below market levels. There are two pricing schemes for petrol, one subsidized the other not. Each month, qualified vehicle owners are allocated a specific number of subsidized liters of petrol (taxi's have a significantly higher allocation). The cost of regular unsubsidized petrol in Iran is IR7,000/liter (approximately 37 US cents/liter) and premium grade petrol IR8,000/liter, whereas the subsidized equivalents go for IR4,000/liter and IR5,000/liter, respectively. The nation's abundant oil reserves have enabled the government to keep prices low (Iran is the second-largest exporter in OPEC). However, low prices have encouraged wasteful consumption and the smuggling of petrol into neighbouring countries such as Turkey, Pakistan and Afghanistan. Some 1.8 billion liters of oil products worth 10 trillion rials ($1 billion) are smuggled out of Iran per annum. Given Iran's limited refining capacity, there has been a shortfall in petroleum products in recent years, requiring Iran to import an estimated 100,000 barrels per day (16,000 m3/d) in 2006/07. As a result, there is a recognition among many policymakers of the need to raise prices, and gradual increases have been implemented. However, these have tended to lag the prevailing rate of inflation, and given that raising petrol prices is politically difficult the provision of cheap fuel is likely to persist in the medium term, encouraging the purchase of vehicles. The government was nevertheless forced to take action in June 2007 when it announced both a petrol increase to 12 cents/litre and the imposition of fuel rationing, much to the chagrin of vehicle owners. The policy, which allocates 120 litres maximum per month (following revisions in December) to private car owners, will run until end-2008/09. In 2008 and 2009, Iranian government spent over 3 billion dollars on CNG infrastructure as part of its plan to convert its fuel policy from gasoline to CNG. Iran, with the world’s second-largest natural gas reserves after Russia, in 2011 became the world leader in natural gas vehicles with some 2.9 million on the road, narrowly edging Pakistan, which is trailed by Argentina, Brazil and India, respectively. (The United States, which does not subsidize and promote the fuel like other countries do, ranks 16th.) Iran has 1,262 vehicles per refueling station compared with 856 vehicles per refueling station in Pakistan. Like other sectors, the automotive industry is suffering from a lack of foreign direct investment (FDI) and capital imports. The privatization process is moving slowly (2008). International sanctions, high inflation, exacerbated by fuel price hikes, and dampened consumer demand have depressed growth in the passenger car segment, but industrial growth coupled with infrastructural development is spurring demand in the commercial vehicles segment. The sanctions have also created difficulties for the imports of spare parts and increased the cost for car manufacturers. To make matters worse, the factory sale prices of cars, which are set by the government every year, have changed very little since 2006. Experts also believe that the removal of subsidies is likely to have an adverse impact on the profitability of the automotive sector until 2013. According to a 2015-survey, car production in Iran will increase by 28% increase following the conclusion of the Joint Comprehensive Plan of Action. In 2015 the government made loans up to $7120 available for purchase of domestic cars (with an interest rate of between 16-18%). The payback period is a maximum seven years or 84 installments. 1 2 3 "Resources - Iran's Automotive Industry Overview". Atieh Bahar. 2008-10-20. Retrieved 2010-11-28. ↑ "Press TV". Press TV. 2011-11-11. Retrieved 2012-01-21. ↑ Iran’s automakers stalled by sanctions. Washington Post, October 14, 2013. ↑ "Iran ranks 5th on OICA growth chart". PressTV. 2010-08-18. Archived from the original on 15 October 2010. Retrieved 2010-11-28. ↑ "Fars News Agency :: Iran Ranks 5th in Car Production Growth". English.farsnews.com. 2010-08-18. Retrieved 2010-11-28. ↑ "2013 Statistics - OICA". Retrieved 10 June 2015. ↑ "SAPCO: Iran Automotive Industry's Market Shares (September 2001)". Archived from the original on 2008-06-17. Retrieved 2011-05-29. . Retrieved November 14, 2008. ↑ "Atieh Bahar". Web.archive.org. 2008-06-17. Archived from the original on 2008-06-17. Retrieved 2010-11-28. ↑ "Iranian Automaker IKCO To Cooperate With Universities To Develop Platforms". Payvand. Retrieved 2013-12-08. 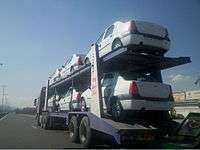 ↑ "Iran unveils four new 'Samand' cars". Digitaljournal.com. Retrieved 2010-11-28. ↑ "Iran-Khodro Starts Samand Assembly in Senegal". Payvand.com. Retrieved 2010-11-28. ↑ "Iran car exports projected to reach $1b by March". Payvand.com. Retrieved 2010-11-28. ↑ "Press TV". Press TV. 2011-11-11. Retrieved 2012-04-12. ↑ Archived May 15, 2009, at the Wayback Machine. ↑ Archived December 16, 2008, at the Wayback Machine. ↑ "Yahoo! News". Sg.news.yahoo.com. Retrieved 2010-11-28. ↑ Sheikholeslami, Ali (2010-07-21). "Iran Sells 18% of Saipa Automaker for $1.6 Billion, Tehran Exchange Says". Bloomberg. Retrieved 2010-11-28. ↑ "Iran Investment Monthly Sep 2010.pdf" (PDF). Retrieved 2010-11-28. ↑ "Azhitechs Official Web Site". Azhitechs.com. Retrieved 2013-12-08. ↑ Iran Daily - Domestic Economy - 06/12/07 Archived June 18, 2009, at the Wayback Machine. ↑ "Iran ranks 2nd in using gas-fueled cars". tehran times. 2010-09-20. Retrieved 2010-12-18. ↑ Iran Daily - Domestic Economy - 06/15/08 Archived December 16, 2008, at the Wayback Machine. ↑ "Iran hopes to resist sanctions by boosting production". The Washington Post. 2013-07-17. Retrieved 2013-12-08. ↑ "PressTV-Iran among top 20 auto producers". Retrieved 10 June 2015. ↑ Archived June 14, 2007, at the Wayback Machine. ↑ "Automotive Industry and Market of Iran 2007". Marketsandreports.com. Retrieved 2010-11-28. ↑ "وب سایتهای ایرنا - Irna". Retrieved 2010-11-28. ↑ "INN". Inn.ir. Retrieved 2012-01-21. 1 2 "Motorcycles Account for 30% of Air Pollution in Tehran". Payvand.com. 2006-11-22. Archived from the original on 7 January 2011. Retrieved 2010-11-28. 1 2 Payvand:Iran car exports projected to reach $1b by March. Retrieved October 24, 2008. 1 2 3 "Iran Autos Report Q4 2008 Market Report, Industry Analysis and Market Trends - 02 October 2008". Companiesandmarkets.com. 2008-10-02. Archived from the original on 4 November 2010. Retrieved 2010-11-28. ↑ Archived August 26, 2009, at the Wayback Machine. 1 2 Archived March 12, 2007, at the Wayback Machine. ↑ Archived September 29, 2009, at the Wayback Machine. ↑ "PressTV-Iran car imports up by 31%". Retrieved 10 June 2015. ↑ "Economics Will Decide the Fate of the Iran Deal". LobeLog. Retrieved 10 June 2015. ↑ "INIC - News - Nanotechnology Finds Application in Iran's Car Industry". En.nano.ir. 2009-11-05. Retrieved 2010-11-28. ↑ "Iranian Auto-Makers in Iran Nano Festival". Payvand.com. 2006-11-22. Archived from the original on 4 November 2010. Retrieved 2010-11-28. 1 2 Archived May 3, 2009, at the Wayback Machine. ↑ Radcom. "IRAN NGV 2010". Ecasb.com. Archived from the original on 21 November 2010. Retrieved 2010-11-28. 1 2 "In Oil-Rich Iran, Natural Gas Turns Wheels". New York Times. 24 October 2012. Retrieved 2013-12-08. ↑ "Central Bank of Iran Special Loan for Locally Manufactured Vehicles - HOMASA CONSULTING GROUP". homasa.ir. Retrieved 2015-11-15. "Iranian automobile industry - Brief study (2003)". Archived from the original on 2008-06-17. Retrieved 2011-05-29.